When she sings, she makes you fall in love not just with the song but with herself. This beauty from Bengal has stolen millions of hearts and continues to do so with her pleasant and melodious voice. 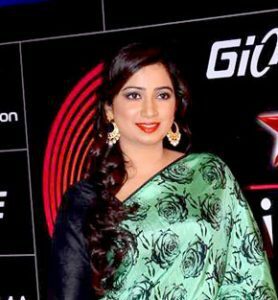 You can listen to your favourite Shreya Ghoshal songs free on BOTY music. Before stepping into the world of films she was a singer who lived in Kota where her father worked. Her talent turned into passion at the young age of four when she started learning music. Her interest in music won her the All India Light Vocal Music Competition, New Delhi, organised by Sangam Kala Group. A student at heart, Shreya owes her success to her mother, her guru, who introduced music to Shreya and trained her by being the best critic!. BOTY has prepared a list of All Her Top Rated and Latest Songs which you will love. Check out the list and listen to your favourite songs for free.